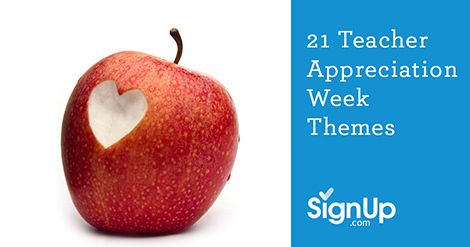 Think beyond the apple knick-knacks for Teacher Appreciation Week with these creative ideas for themes and gifts! Make this year’s Teacher Appreciation Week one they’ll remember forever. Do Your Homework The best way to find out what teachers would most enjoy is to ask the teachers themselves. A short survey will allow you to personalize your game plan for each teacher, whether that means a focus on her favorite color in a gift basket or providing his favorite cupcakes for the classroom party. Do the Cooking Teachers are busy, often well into the evening. Show that you appreciate the time they’re giving your kids by making those evenings easier—at least during the busiest times. SignUp.com makes it easy to circle up other parents and coordinate meal preparation and delivery. Next time you’re cooking, freeze extra portions for use whenever your favorite teacher is feeling overwhelmed or schedule a drop-off when you know he or she is especially busy. SignUp.com has a free reminder service so your participants will stay organized and on time! Spa Week Teachers are always overworked and under-rested! Give them a chance to relax, whether that means arranging for discounted chair massages in the teacher’s lounge or simply having parents put together gift baskets with candles, hand-made soaps, bath salts and gift certificates. Go one step further by making the teacher appreciation lunch a spa-style buffet, with cucumber-infused water, spring rolls and fresh fruits. Top Secret Channel your inner Sherlock Holmes for this Teacher Appreciation Week theme! Decorate the teacher’s lounge with giant fingerprints and magnifying glasses, and make posters with phrases such as, “We spy the world’s best teachers!” and “It’s no mystery, our teachers rock!” Then, leave a trail of clues that will lead teachers to great Teacher Appreciation gifts. Tropical Getaway Give teachers a tropical mini-vacation with this Teacher Appreciation theme! Don’t forget the beach umbrellas and leis for the teacher luncheon, and give gifts perfect for the upcoming summer vacation – beach towels, magazine subscriptions, sunscreen, flip flops, beach towels, reusable water bottles, and so on! A Picture is Worth 1,000 Words Nothing brings back memories or tells a story like pictures, and there’s no better way to show your kids’ teachers how much impact they’ve had. This Teacher Appreciation Week, create digital classroom scrapbooks and slideshows to share with teachers and their classes. Make collages of pictures from the year and frame them for a meaningful keepsake. Make New Memories At the Teacher Appreciation luncheon, set up a photo booth with props and let the teachers show their silly sides. They’re “the grown-ups” all day, every day! Make prints or digital copies available after the event or create a slide show for everyone to enjoy. To Infinity and Beyond What teacher can’t use some high-quality “rocket fuel” in the morning? Incorporate coffee/tea shop gift cards into your space-themed Teacher Appreciation Week! Your favorite teachers are already “out of this world,” right? Let them know by incorporating stars, planets and rocket ships into posters, door decorations and more. Picnic Throw a picnic for a very versatile and easy Teacher Appreciation meal. Use gingham table covers, decorate with potted plants that can do double duty as teacher gifts and serve barbecue and all the trimmings. Collect family-favorite recipes for a cookbook from students, and give along with grilling utensils and BBQ sauce. How Does Your Garden Grow? Focus on the theme of growth in this Teacher Appreciation theme. Build a bouquet by having each student bring a flower to their teacher on a designated day. Serve salad and tea sandwiches for lunch. Use phrases like “The roots of knowledge go deep” and “Thanks for helping us grow” for gift baskets and decor. Go Gourmet For teachers who love to cook, put together gift baskets with aprons and wooden spoons, gift cards to kitchenware and home essential stores. Create a gourmet teacher luncheon with a chocolate fountain, or arrange for a cooking demonstration by a local chef. Giddy Up Bring the wild, wild west to teacher appreciation with this theme! Supply bandanas and cowboy hats for teachers. Decorate tables with gingham and mason jars and design gift baskets in inexpensive metal pails. Spotlight much-loved teachers on “Most Wanted” posters for being the best teachers on two legs! Best Teachers in the World Take a global approach to Teacher Appreciation week with this multi-cultural theme. Have experts come in to teach folk dancing from other countries, organize a luncheon that incorporates food from other lands, use maps and fabrics that represent other cultures as décor. Often, your own student body is a rich resource of diversity and people love to share their heritage with others. Stuff The Supply Closet Most teachers end up spending their own money on supplies for their classrooms. Using SignUp.com, create a school supply wish list for each classroom and have participants sign up to bring items to fill up your teachers’ supply closets with the most needed supplies, like paper, pens, tape and markers. If you decide on this theme early in the year, you can take advantage of the great back-to-school pricing on supplies, but if not, contact manufacturers directly for deep discounts. Up With Teachers Get on the up and up for this Teacher Appreciation Week theme. Play off phrases like “Wake up” and have a food truck stop at the school for free coffee and breakfast; “Dress up” and decorate the teacher’s lounge to the nines, “Surf’s Up” for fun beach-themed food and gifts…the ideas are endless! Good Sports Organize a sports-themed Teacher Appreciation Week! If there is a local favorite team, decorate the hallways with its logo. Create a “Team Roster” of your teachers with fictitious game stats. Share tickets to local sporting events and festivals, and give gift certificates to local sporting stores as teacher gifts. Save the Day Teachers are the unsung super heroes of our kids’ educations! Give teachers capes to wear for the day, and make tiny cardboard buildings that teachers can leap in a single bound. Have students write letters to their hero teachers and compile them into a scrapbook, and decorate the staff lounge with hero inspired signs and action bubbles. Wild About Teachers Take a walk on the wild side with this Teacher Appreciation Week theme. Use banners with phrases like, “We’re wild about our teachers!” and serve animal crackers and bananas for snacks. Décor is easy with animal prints and balloons in jungle colors of green and brown. A Seussical Event The work of Dr. Seuss is a treasure trove of ideas you can play off in designing a perfect Teacher Appreciation event. Tap into the fun and whimsy decorating with over-sized props for teachers to pose with for keepsake photos. Incorporate the classic books in naming your lunch dishes—the Hop On Pop (popcorn bar) and Red Fish, Blue Fish (gummy fish) or an entire luncheon called the Who Feast! Hooray for Hollywood Give your teachers the star treatment in this Teacher appreciation week theme. Roll out a red carpet, decorate hallways and classrooms with movie-related posters and props, serve popcorn and other traditional movie snacks all day long in the teacher lounge, and hand out “Academy Awards” for excellence in teaching. Souper Star Teachers One popular idea for an easy Teacher Appreciation luncheon is a soup bar, offering up to 10 different soups in slow cookers provided by parents. Use SignUp.com to organize the perfect potluck including the loan of the slow cookers, the soups, the side dishes and the desserts. Set up the buffet and allow teachers to help themselves!